I’m so happy it is spring! Sunshine! Flowers! Gahhh! I just want to be outside all the time!!! April was a fast and furious month with my return to work just in time to kick my event planning into full gear. I was so thankful to have a week of half days for the initial return so I could practice using my brain and wearing pants that button. Mr. J was home with the little one for 2 weeks and I really loved seeing them really bond while I went back to work. 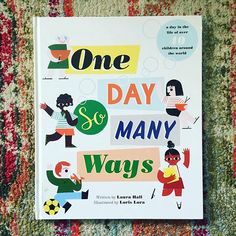 I think the twice a week blogging is here to say. It seems to be a better schedule for me to have the chance to cook some good stuff but also not feel pressured to have every meal blog-worthy. Repeating meals or cooking without photos is nice, ya know? 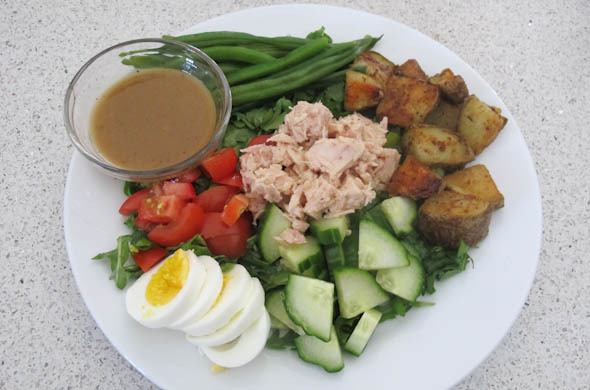 My salad dressing this month was early but I was so happy with my Tuna Nicoise salad. It was the winner this month as my favorite. It also was my only seafood post this month. Oops. I’ll get on that. This month I was also really proud of my bacon, cheddar, & caramelized onion quiche. Best one I’ve ever made. Plus I have more caramelized onions in the freezer just waiting for a chance to hop into a panini or ontop of a pizza! 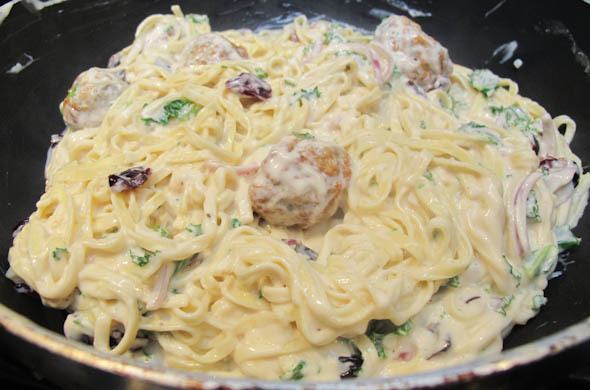 I really loved this chicken meatball, cranberry, kale, and onion alfredo pasta dish. So good. This was my restaurant recreation that I just adored. It was oddly fulfilling to challenge myself to take the elements of a truly special dinner and recreate it as a quick weeknight meal. 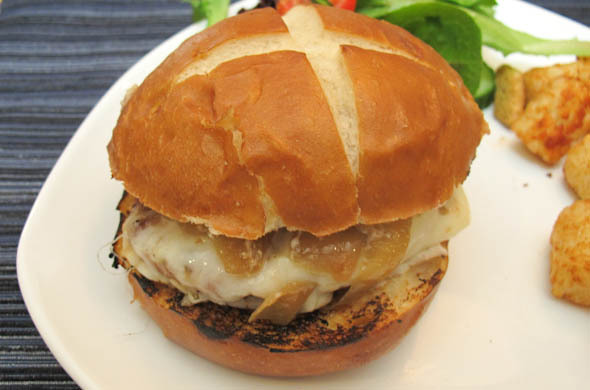 The “smokehouse” burger with smokey aoli, havarti, caramelized onions, and pretzel rolls! We’re so in love. He’s just a joy. That doesn’t mean every day, or every minute is rainbows & unicorns, but Baby T is happy and that spreads to us. He is smiley and coos a lot. Baby T’s hair is cracking me up. There’s so much on the back and not much on the sides right now. He’s growing so quickly! Sometimes I look at him and think he’s like a wiggly little boy rather than my baby! I imagine I’ll do that for the rest of his life, am I right?! The other day I took the babe in the stroller and brought one of the dogs on a walk. I felt like a million bucks getting the 2 out at once! Windsor is such a good dog and I was really proud of him. To show my appreciation, I was realllly careful not to bump him with the stroller. Likes: daycare! Phew! It was an easier adjustment returning to work and starting him at daycare than I thought. They’re really sweet and he seems happy. We all did well with the transition. He loooves daddy! This month especially Baby T’s face lights up and he cracks a huge smile when he spots his Dad. It is really sweet to see. He likes grabbing at toys hanging above him and holding toys. 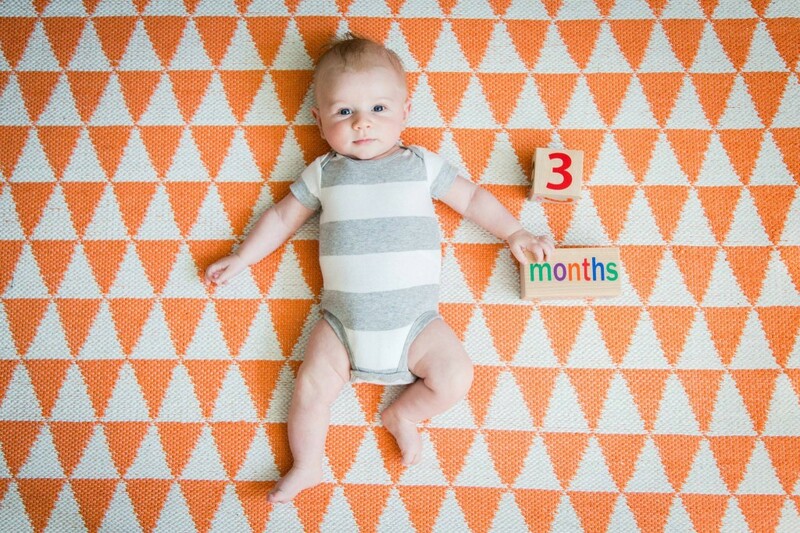 Dislikes: sometimes the early evening nap/snooze isn’t on the agenda for more than 15 minutes. He had a few nights where he was vocal about not getting back to this nap. The Year of the Earring: ehh. I got several pairs for my birthday so I still had a few to be “new” this month. 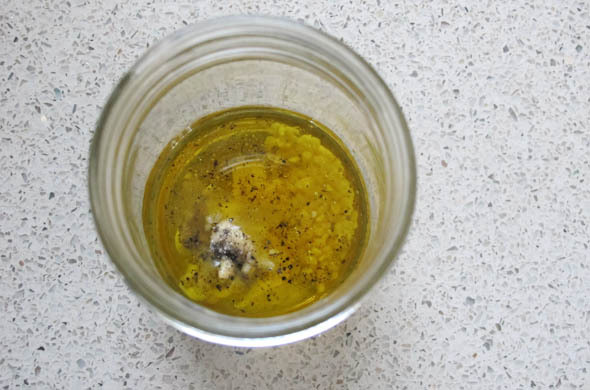 make more salad dressings: YES! I did it! I made dijon vinaigrette for my tuna nicoise salad. Seriously so easy. 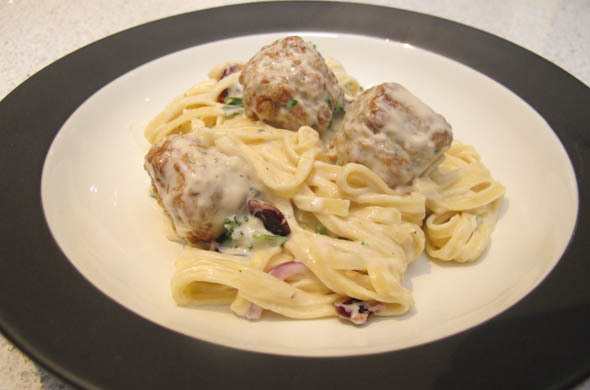 recreate restaurant menu items: I recreated a much faster version of the turducken meatball alfredo pasta I had from Isabella’s. Forget pinterest…restaurant inspiration is where it’s at. 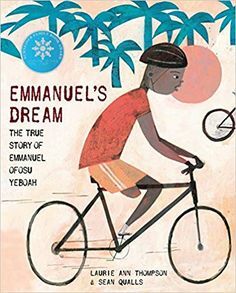 be more adventurous with my reading selections: I didn’t read a ton, but I read The Children Act, which wasn’t amazing. Now I’m part way through Running the Books: The Adventures of an Accidental Prison Librarian. That one is more adventurous. I was all jazzed to read a Laura Ingalls Wilder Autobiography until I realized it was annotated. Yeah. It weighed about 5 pounds and had a zillion footnotes. You can’t just read that. use the crockpot more: Nothing this month. seafood once a month: I think tuna on my salad is going to have to count. I’ll do a better job in May, also since it is grilling season. 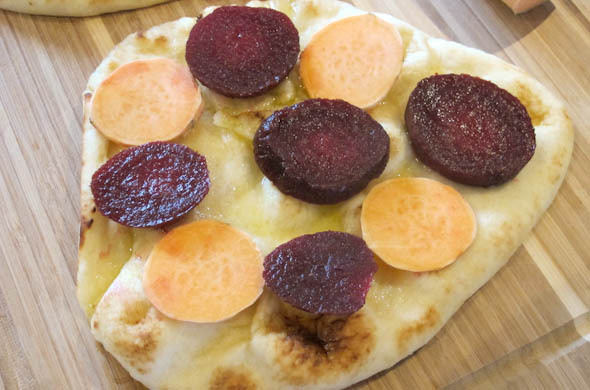 With spring in full bloom I wanted to make a flatbread to highlight veggies for a lighter/meatless meal. I also am crazed at work getting ready for my big event this week. This insta-dinner taking only a few minutes to throw together was ideal. With the babe at daycare and both Mr. J and I back to work, we’re getting into the new routine. I love roasted beets but they take awhile and it involves the oven cranking away and you have to be careful not to stain anything with the juice. And and and. Apparently I’m full of excuses as to why I don’t make them all the time. 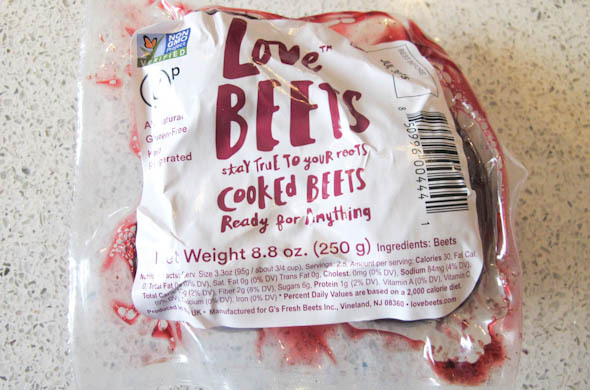 I spotted packaged beets at the grocery store. That is one prepared item I can totally get behind. The convenience of these is much appreciated. The foil-wrapped potatoes is a whole different story. Who can’t do that on their own?! Have you seen these? I found these cooked beets in the produce area near coleslaw mixes. Totally worth it. I forget what I paid, but I’d do it again. Maybe $4ish for 3 large beets. Or, if the grocery store has a good salad bar you might even find beets there too for even cheaper. That’s a great source when you don’t need much of something for a recipe. Preheat the oven to 400-degrees. Lay the naan on a baking sheet. Slice the beets into thick slices and the sweet potato into thin slices. 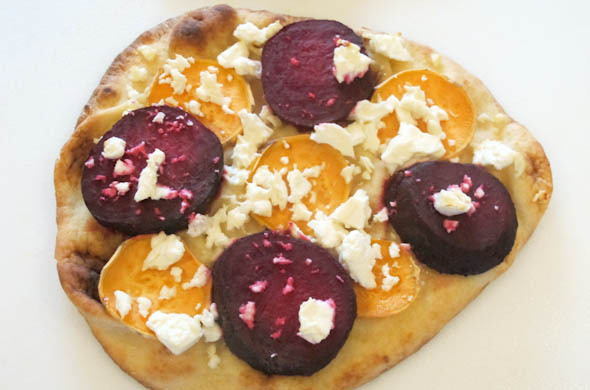 Drizzle the naan with olive oil then top with slices of raw sweet potato and slices of the beets. 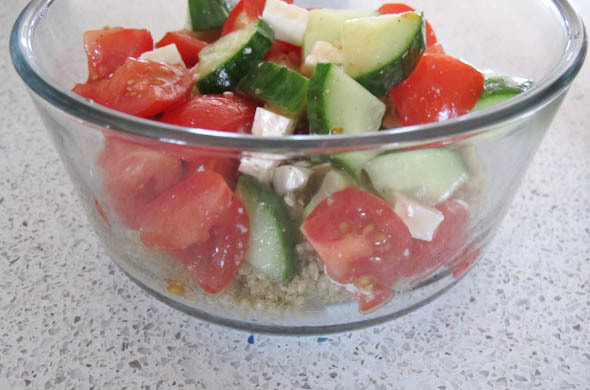 Crumble the feta onto the top. Bake for about 10-15 minutes until the naan crisps a bit and the toppings warm through. I loved these. I loved how little time it took for something different. 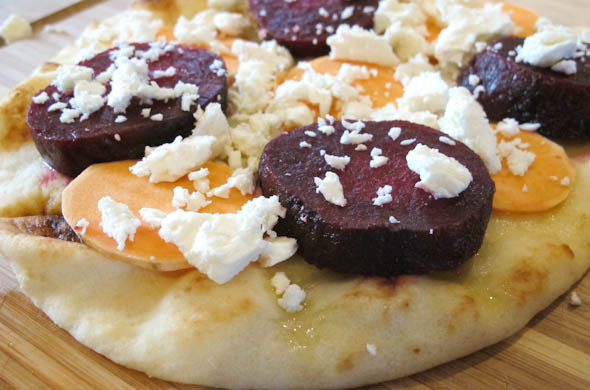 The feta was so good with the beets and since I most often use feta cool, it was about time to put it in something cooked! I was lucky the sweet potato was so thin or it’d never have cooked in time with everything else. 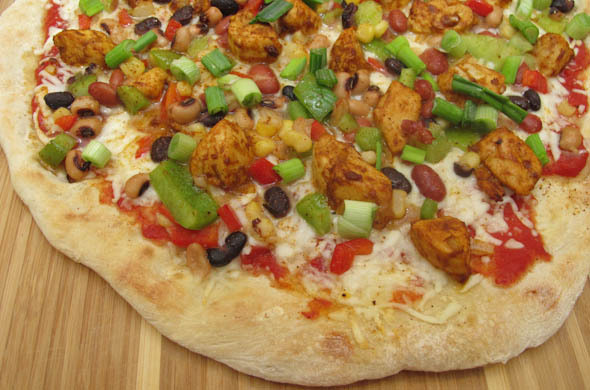 Using prepared flatbreads takes this from a more involved meal to a real quickie. Pita breads would work well too. 10 minute cooktime is PER-FECT for a weeknight. You can’t even decide on takeout pizza toppings in that amount of time! About a month ago, Mr. J and I left the little one at home with the most qualified babysitters (his grandparents) and we went on a date! It was our first time out without him and boy were we rusty on date planning. I had been eyeing a pub-ish restaurant with fun burgers and a great beer menu. Turns out, it is closed. womp. womp. We then went through 2 more options and set out for a 3rd spot. On a whim, we checked in at Isabella Restaurant (which was our 4th restaurant idea, where the wait can be an hour on a TUESDAY) and they just had a table for two open up. Perfect! It is sooo dark in there so there’s never a chance for a photo but the menu is always creative, pretty seasonal, the portions are substantial, and everything they make is excellent. 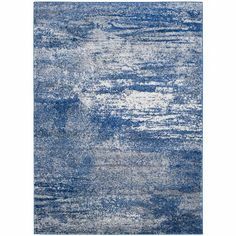 I wish it were a bit more affordable, but this splurge was fun to celebrate our first date out. 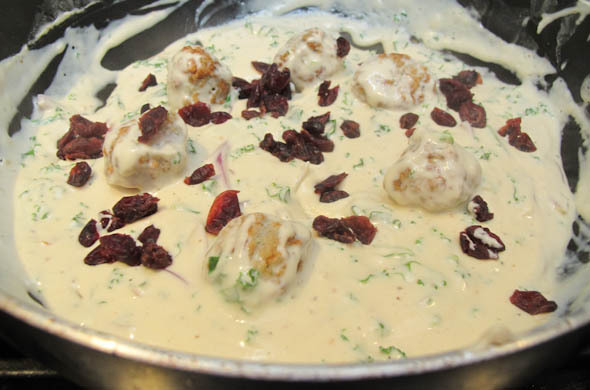 I got Turducken Meatballs that were turkey/chicken/duck meatballs with dried cranberries, spinach and red onions in a parmesan cream sauce. The meatballs were ah-mazing and I knew I wanted to recreate it at home, but I simplified it. Don’t get scared off by the cranberries. 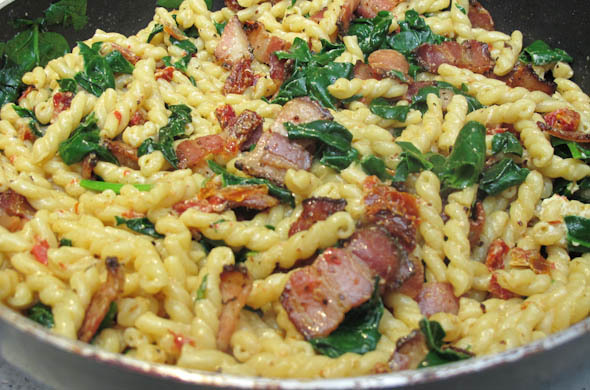 They’re such a great addition and this pasta dish wouldn’t be the same without them. Ditto for the red onion. I used frozen chicken meatballs and ready-made alfredo sauce to turn my #restaurantrecreation into a speedy weeknight dinner. Everything cooks quickly so I had to move fast and keep an eye on it to not overcook anything. The meatballs I used were fully cooked and I didn’t want to obliterate the kale, onions, or cranberries so they were very lightly cooked. While the water heats, defrost the meatballs (if frozen) and chop the kale and onion. 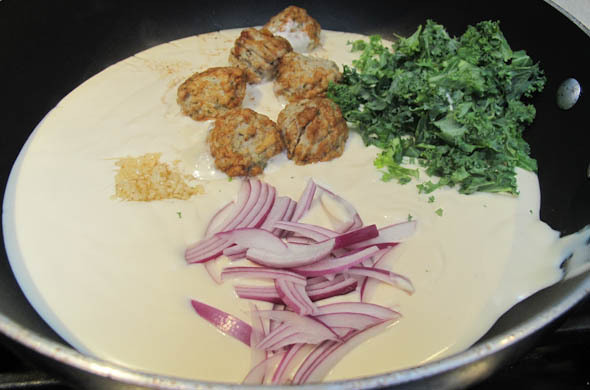 Add the alfredo sauce to a large pan and add in the meatballs, garlic, onions, and kale over medium low heat. Cook for about 3-5 minutes, to warm everything and to cook the kale a bit. Stir, and add in the cranberries to cook for another 2 minutes. Cook the pasta according to the package. My fresh pasta only needed about 2 minutes. When al dente, add it to the pan with the sauce to cook just another minute or two. The fresh pasta makes a huuuge difference and is a great touch for a special treat. I like that the onions add a bite with the cranberries providing a tang and touch of sweetness. Spinach or arugula would be good in here too instead of the kale. If I were going all out, I’d make the sauce (and meatballs) myself but throwing this together was just so easy but became different flavors for us. I doubt I’d think to use red onion. Fun fact: if red onion is too strong or overwhelming, or if you’re using it raw, you can soak it in cold water for 3-5 minutes. It’ll tone it down a bit while still giving some flavor. In an effort to mix up my lunch while still keeping it easy (and one-handed with the babe) I tossed together these quinoa bowls. I wanted something salad-y without lettuce. I was seeking farro or barley but came up short while grocery shopping. Really, I just wanted a different grain than I usually have but my grocery store is obsessed with moving everything around and I couldn’t find either one. It was a speedy shop while the little one napped in my cart and I figured I wouldn’t press my luck when he was happily napping. I made 2 servings and was glad to grab the other the following day. 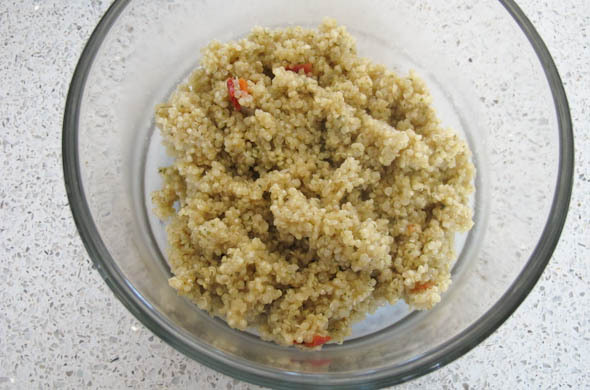 Cook the quinoa according to the package and spoon into bowls. I used about 1 cup prepared for each bowl. Add in a little dressing and toss. Spoon veggies on top of the quinoa. 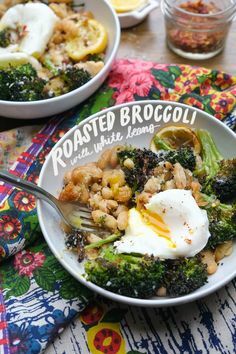 I ate one serving immediately and loved the warm-ish quinoa and the cool veggies. 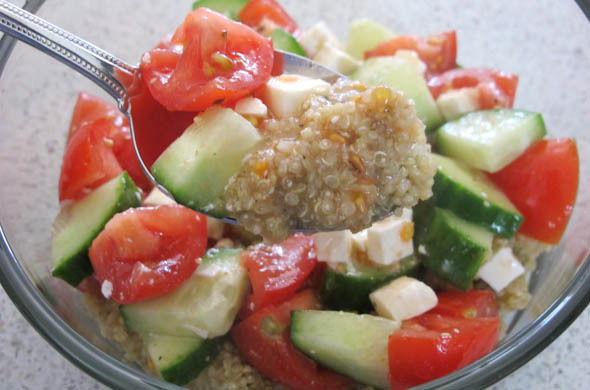 The tang from the vinegar dressing was perfect with the veggies and to season the quinoa a bit. The next day it was still good and I didn’t need more dressing. It might not be great a 3rd day as the sliced tomatoes could be a bit mealy by then. Prepping the quinoa and mixing the veggies the day you’re eating it would still make for an easy lunch too, or using whole cherry/grape tomatoes would give it a bit longer of a fridge-life. I found pretzel rolls at my regular grocery store and was super excited. Maybe more excited than I should have been! The last time I wanted pretzel rolls I had to pop into Whole Paycheck and they weren’t that great. I knew these would be perfect for a burger (and they were). I’m grinning and twiddling my fingers to scheme up the use for the 2 I stashed in the freezer for future use muah-ha-ha-ha. I love pretzel rolls. The grocery store had long ones too and I hope both sizes are here to stay. The liquid smoke is a staple in my chili and I figured a dribble would be good in a spread on this burger. It lasts forever and the mayo only needed a little to become something special. I didn’t season the burger meat, but a dusting of some bbq rub might have been tasty. After making the BLT Panini, I had some really good bacon leftover so I wanted to make something else fun with it. I have no trouble finding uses for it but I thought about adding it into a pasta and then decided to let it have the spotlight. 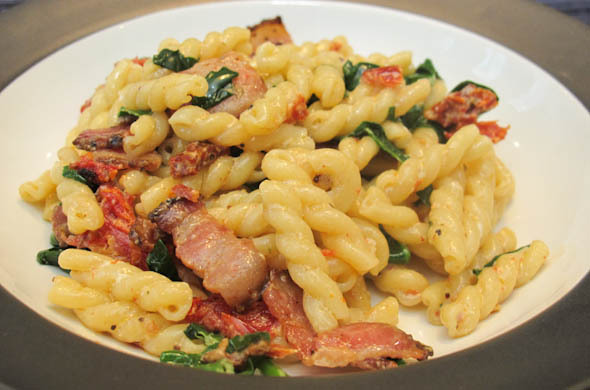 Sundried tomatoes and spinach rounded out the BLT-ness of this and the sauce was really minimal. The minimal is good in this scenario since the 1980s are probably trying to reach me and take the sundried tomatoes back. 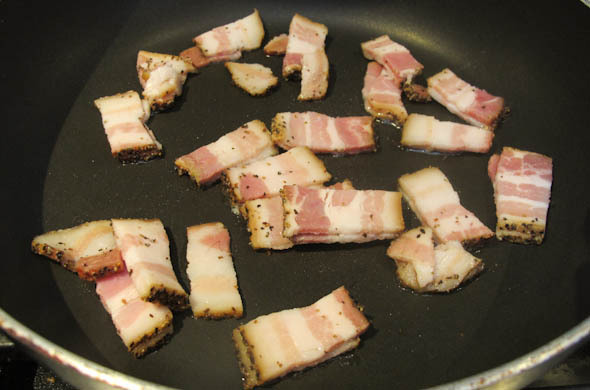 Pan fry the bacon until crisp in a large skillet, then remove and drain on paper towels. Remove from the heat and discard half the bacon grease (keeping half in the pan). Cook the pasta to al dente according to the package. 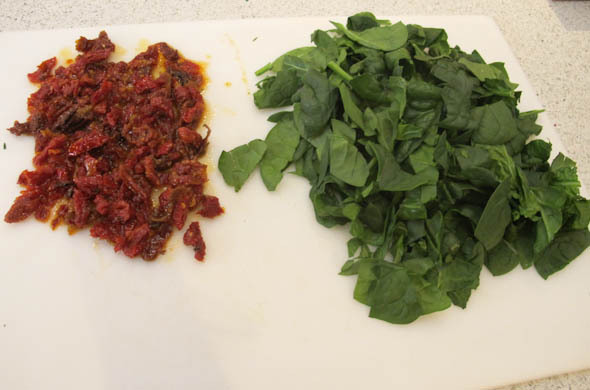 Chop the sundried tomato and spinach to the size of your liking. I chopped the spinach just a bit and chopped the sundried tomatoes a lot. Drain the pasta when cooked reserving a bit of the starchy water. In the skillet with the bacon drippings, add in the butter and the cream cheese, melting over medium low heat. 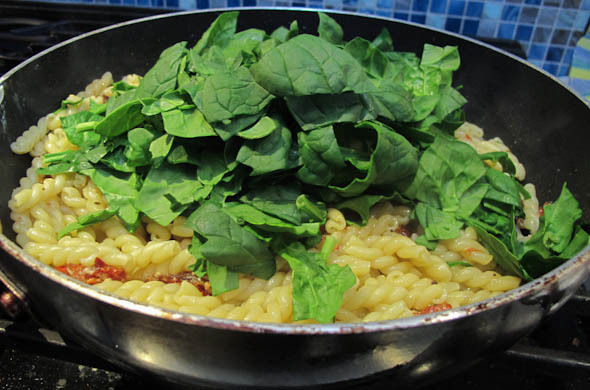 Add in the milk, pasta, sundried tomatoes, parmesan, spinach, salt & pepper. Raise heat to medium and toss well to coat for 1-2 minutes. If it seems too dry, add in a splash of the cooking water. I liked the simplicity of this dinner. I didn’t want the spinach to disintegrate completely, just to warm a touch. I’m all about sundried tomatoes lately. Sometimes you just need to revisit something to remember what a fun tough it brings. Roasted cherry tomatoes would be good too. 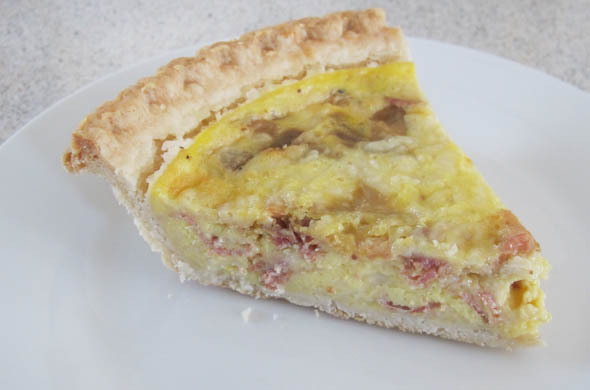 This might be my new favorite quiche. Bacon and cheddar is a happy union but the caramelized onions add some sweetness to the party. I need caramelized onions in my life more often. I bought onions and then discovered I already had a bunch. Oops. 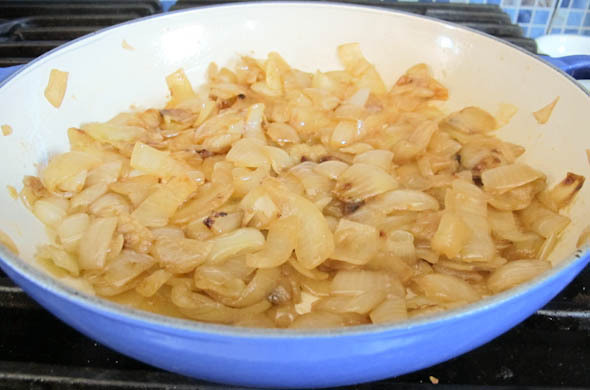 Time to make a batch of caramelized onions before mine start growing sprouts. I made a big batch and froze the rest for the next pizza that needs a topping, or omelette that needs something special, or the next panini. If you’re going to take the time/patience to caramelize one onion, you might as well caramelize a bunch. Cut onions into thick rings then in half and half again the other way. 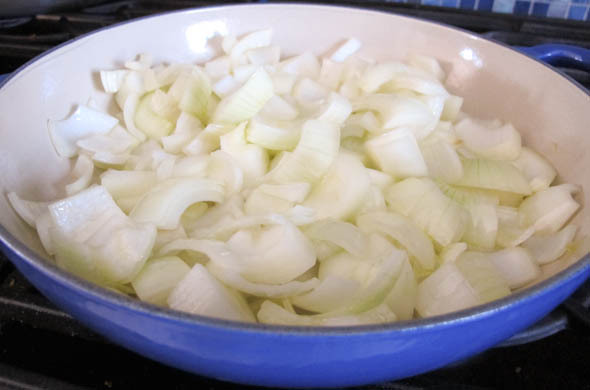 Caramelize onions in a heavy skillet over low heat and 1 tbs of olive oil. Cook over low, stirring occasionally for 30-40 minutes until lightly browned. 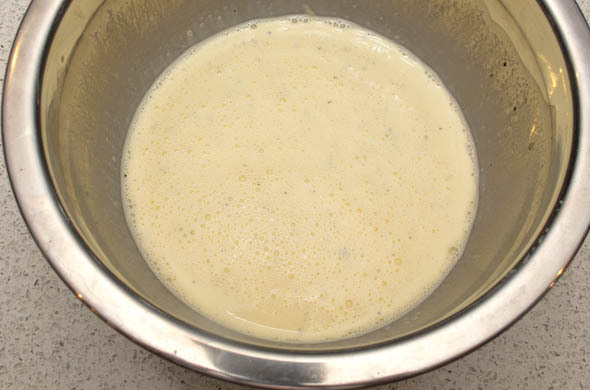 Whisk together the eggs, yolks, milk, mustard, cream of tartar, salt & pepper. 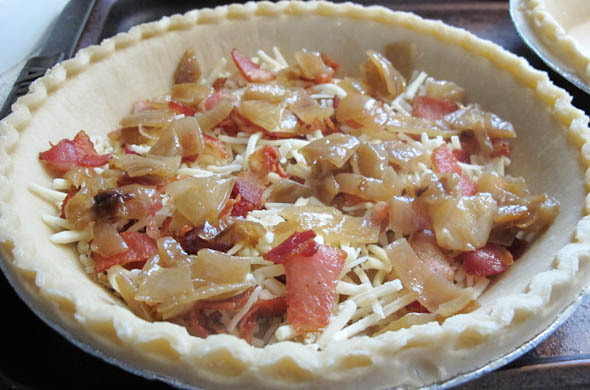 In the crust, add in the cheese, bacon, and onions in layers. Pour the egg liquid mixture over the top. Bake 30 minutes until the center is set. Let cool before slicing. Enjoy! I love the smoky bacon with the sweet onions, with the sharp cheddar. Pure bliss. 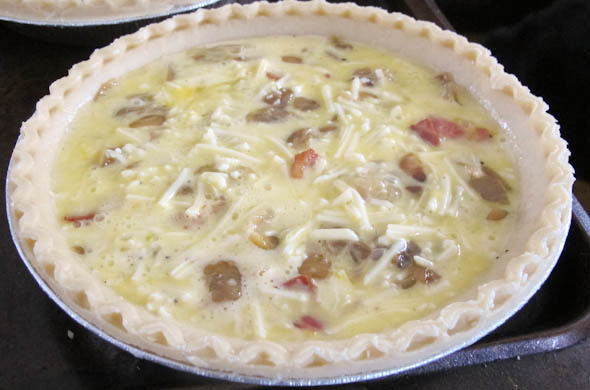 Quiche is perfect for breakfast or lunch and I loved having some on hand. I doubled the egg mixture (thanks to eggs from the ‘rents) and made my sis a broccoli cheddar quiche at the same time. A crust pack of 2 and plenty of cheese on hand helped remind me that making 2 quiches at once was the same amount of work as making one. Try it. Double the egg mix and use the veggies you have around and gift one away. It’ll feel as good as it tastes. This pizza was almost something entirely different. One of my toppings spoiled before I got to it so that pizza will just have to hit on my to-make list until I get to it next. I tossed the slimed produce and then thought: what in this fridge can become pizza? The answer: everything! 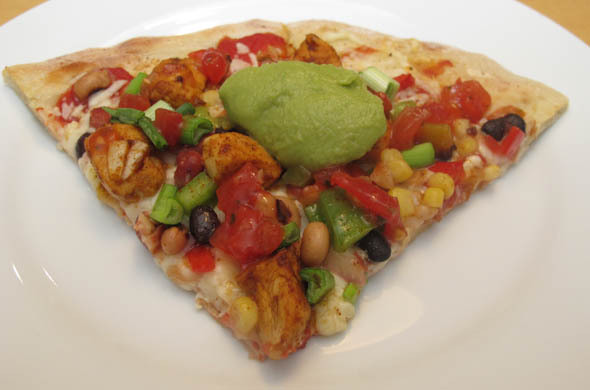 I had chicken and then I spotted our favorite bean dip that got me thinking Mexican pizza! I’ve made Taco Pizza on a Tortilla Crust and Taco Pizza Topped with Salad but this one is different because it sports this unbelievable bean thing. It’s not quite a dip, not quite a salad. We eat it as a side dish or dip tortilla chips into it. So good. Cook the chicken in the taco seasoning until cooked through. Preheat the oven and pizza stone if using one, to 400-degrees. Roll the dough out to be a thin flat circle, or as close to that as you can get. Immediately place onto the pizza stone to cook slightly and to stop it from shrinking back to a ball. Poke a few holes into the dough. Bake 15 minutes until lightly cooked and starting to brown. Then remove from the oven. Top with tomato sauce & half of the salsa, cheese, chicken, and 3 bean fiesta. Then return it to the oven. Bake 15-20 minutes until the cheese melts and the crust browns. Remove from the oven and let sit for 5 minutes before slicing. Top with green onion & remaining salsa. Serve with avocado or guacamole & enjoy! I liked this pizza. The tang of the 3 Bean Fiesta is really the wow factor. 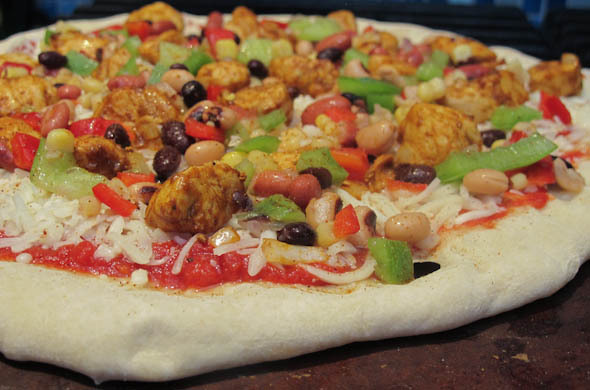 The sweet/acidic bite to it takes it from being just beans on a pizza to a whole different flavor. Plus, it has corn, green pepper, and onion to make it really taco-ish. I love it but 3 cans of corn, plus the other veggies, means you really need a few people eating it, or some solid plans for the leftovers. I use the leftovers on salad, on tacos/burritos/quesadillas, as a side dish, or still as dip. It is best a few hours after making it but everyone loves it and I can’t say enough good things about it. I’m capitalizing on salads while I’m home on maternity leave. It is a good reminder how lucky I am to a) get a freshly cooked lunch at work, and b) that there’s always salad all ready with lunch. This salad took a bit more prep than just tossing some veggies with greens but I loved it and was so happy with my quick dressing! I’m counting this as my monthly eat-more-fish goal and my make-more-salad-dressings goal, though I will get my act together and eat more fish that isn’t just on salad. Tuna Nicoise is the French cousin to our cobb salad. The cooking required is for the potatoes, egg, and green beans. You could include artichokes or seared tuna, or sardines if you’re feeling especially French. It looks so pretty before you dress it or before scooping bites of this and that. It is definitely a salad that feels like a meal. 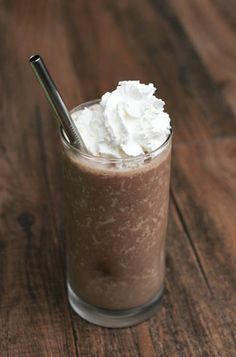 Shake well for 1 minute. Taste & adjust as needed. Add more honey if it is too bitter for you, or more vinegar if it needs more of a kick. 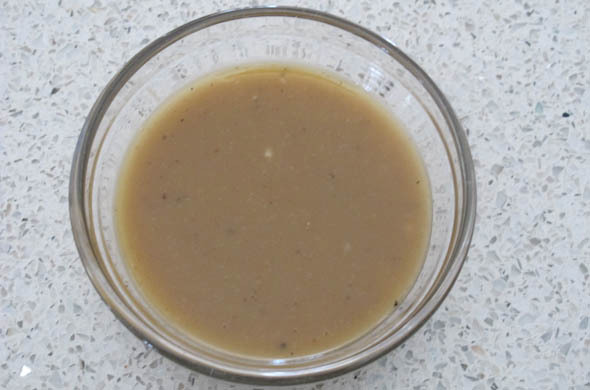 Making salad dressing is so easy, which is why I wanted to make it more often. I have all these ingredients on hand AND I didn’t make a ton. That allows me to have different dressings all the time without making a gallon and feeling the need to use it all before going onto the next one. This dressing is light and easy to tweak to your tastes. 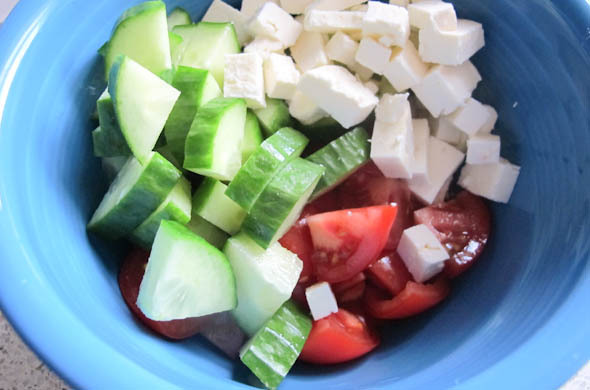 By having it over this salad, it made me thing that salad dressing is a great use over steamed green beans or to mix into tuna. Part of what I loved in this salad was the roasted potatoes. 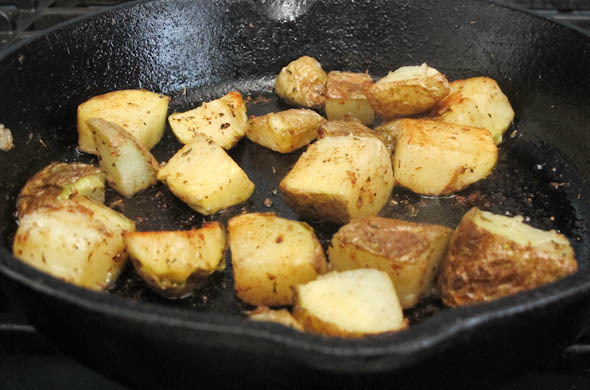 I nuked a potato, cut it into cubes then pan fried it in herbed butter until crisp. These potatoes were definitely a star of this salad. The butter was leftover from my salmon baked in herbed butter. I steamed the green beans while the potatoes were crisping then shocked them in ice water to keep them from going limp. Each bite had me thinking that this is the best bite. Then I’d be all “mmm tuna and potato”, no that’s the best bite…”mmm egg and green bean”, no that’s the best bite. I love the fun stuff in salad, aka the heavy stuff that makes it pricey at a salad bar, and this one delivers on that. The greens below aren’t quite an afterthought, but they’re not what this is all about. I didn’t mess around much with the tuna – just half of a can (of chunk white tuna in water) with a tiny bit of Italian salad dressing to dress it really lightly. I ate the exact same thing the following day for lunch, it was that good.